The meaning of all this is clear. We are in mid-lent. On the one hand, the physical and spiritual effort, if it is serious and consistent, begins to be felt, its burden becomes more burdensome, our fatigue more evident. We need help and encouragement. On the other hand, having endured this fatigue, having climbed the mountain up to this point, we begin to see the end of our pilgrimage, and the rays of Pascha grow in their intensity. Lent is our self-crucifixion, our experience, limited as it is, of Christ's Commandment heard in the gospel lesson of that Sunday "If any man would come after me, let him deny himself and take up his cross and follow me" (St. Mark 8:34). But we cannot take up our cross and follow Christ unless we have His Cross which He took up in order to save us. 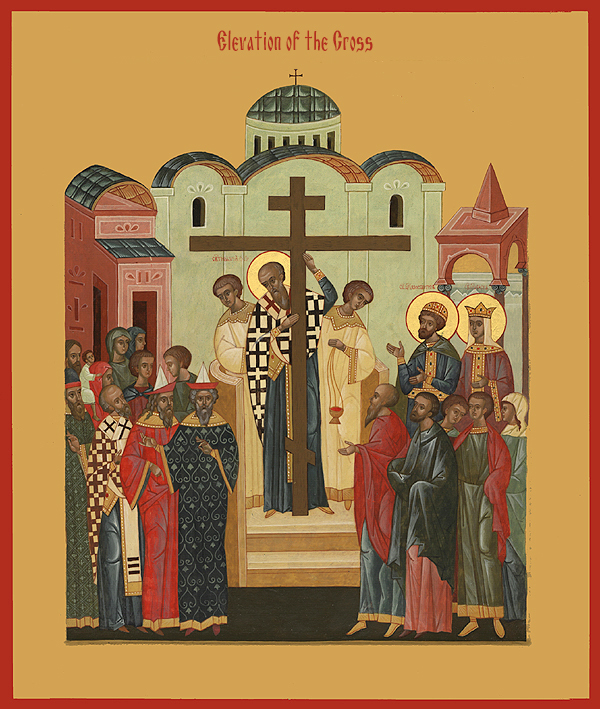 "On this Sunday, the third Sunday of Lent, we celebrate the veneration of the honorable and Life-Giving Cross, and for this reason: inasmuch as in the forty days of fasting we in a way crucify ourselves...and become bitter and despondent and failing, the Life-Giving is presented to us for refreshment and assurance, for remembrance of our Lord's Passion, and for comfort...We are like those following in a long and cruel path, who become tired, see a beautiful tree with many leaves, sit in its shadow and ret for a while and then, as if rejuvenated, continue their journey; likewise today, the Life-Giving Cross was planted in our midst by the Holy Fathers to give us rest and refreshment, to make us light and courageous for the remaining task...Or, to give another example: when a king is coming, at first his banner and symbols appear, then he himself comes glad and rejoicing about his victory and filling with joy those under him; likewise, Our Lord Jesus Christ, who is about to show us his victory over death, and appear to us in the glory of the resurrection day, is sending to us in advance His Scepter, the Royal Symbol--the Life-Giving Cross--and it fills us with joy and makes us ready to meet, inasmuch as it is possible for us, the King Himself, and to render glory to His victory...All this in the midst of Lent which is like a bitter source because of its tears, because also of its efforts and despondency...but Christ comforts us who are as it were in desert until He shall lead us up to the spiritual Jerusalem by His Resurrection...for the Cross is called the Tree of Life. It is the tree that planted in Paradise, and for this reason, our Fathers have planted it in the midst of Holy Lent, remembering both Adam's bliss and how he was deprived of it, remembering also that partaking of this Tree we no longer die but are kept alive..."
Thus, refreshed and reassured, we begin the second part of Lent. One more week and, on the Fourth Sunday, we hear the announcement: "The Son of Man will be delivered into the hands of men and they will kill Him, and when He is killed, after three days He will rise again" (St. Mark 9:31). The emphasis shifts now from us, from our repentance and effort, to the events which took place "for our sake and for our salvation." "O Lord, Who made us anticipate today the Holy Week for shining brightly by the resurrection of Lazarus, Help us to achieve the journey of the fast." "Having reached the second half of fasting, Let us make manifest the beginning of life divine; And when we reach the end of our effort, May we receive the never-failing bliss." The Orthodox volunteers from the Monastery of Saint John Chrysostomos will be at Saint Andrew. They will, as always, Lenten foods, pastries, icons made by our nuns, and other religious items. We must all appreciate their devotion to our Women's Monastery in Wisconsin and the long trip they make to bring us all the wonderful things they do. They are all our good friends and fellow Orthodox Christians.